MSI is one of the most prolific netbook makers, so it's not a huge surprise to see it muscling into the emerging tablet market too. What is surprising is that it's taking an eternity: despite months of news releases and artfully shot images, you still can't buy it. So what's going on? It looks like the WindPad models we first saw last January weren't quite ready for prime time, because the WindPad specifications MSI is talking about now include Menlow and Tegra processors, Windows 7 and Android 3.0. According to MSI's press release there will be two versions of the MSI WindPad. 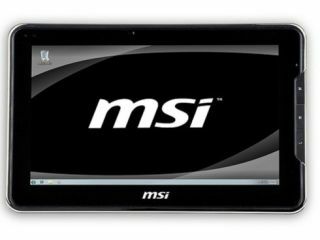 The MSI WindPad 100A will be running Android, and the MSI WindPad 100W will run Windows 7 Home Premium. Not content with Windows 7's touch features, MSI has added its own touch overlay to make the WindPad more finger-friendly. It's not clear whether the WindTouch software will also appear on top of Android. MSI says the release date will be "Q1 2011", but others are more specific: Engadget says the WindPad tablet release date will be February, or March, and Journal Du Geek reports that the Windows version will go on sale in France in February. We'd expect a UK release date either simultaneously or shortly afterwards. The Windows WindPad, the 100W, will pack a 10.1" screen, an Intel Menlow Z530 processor, a 32GB solid-state hard drive, 1024x600 resolution and an HDMI output. It all sounds rather netbook-y, doesn't it? The Android model, the 100A, will have a dual-core Tegra 2, more dots in its 10.1" screen - 1280 x 800 this time - and Android 3.0 if it's finished in time. MSI promises "gravity detectors", but sadly they just mean that the MSI WindPad can tell if it's hurtling through the air en route to a close encounter with the ground. The MSI WindPad specifications also include an ALS light sensor to adjust screen brightness, a compass and GPS, Wi-Fi and optional 3G. The WindPad is a year late, and all of a sudden MSI's worrying about deadlines? Apparently so. It's a funny old world. Are you surprised? We're not. MSI prices tend to be reasonable rather than dirt-cheap or super high, so we'd expect the WindPad UK price to be competitive with other similarly specified Android tablets. For the Windows model, think high end netbook prices: Asus's Windows tablet, the EP121, looks set to be £800-plus, but it's considerably more powerful than the MSI WindPad. MSI has announced US pricing for the 100W of $499, and Journal Du Geek says the price in France will be 550 Euros. At current exchange rates and taking VAT into account, that means a UK price of around £500 to £560.